OAKLAND — Yusuf Bey IV ordered the retaliatory killing of a homeless man in 2007, but it was carried out by his girlfriend and a member of Your Black Muslim Bakery who were never charged in a crime, a witness testified Wednesday. Lakeya Nicole Robinson told jurors in Bey IV’s triple murder trial that a woman named Jasmin Siaw admitted to her in 2008 that she and bakery member Tamon Halfin killed Odell Roberson in July 2007. Robinson was called as a defense witness by Gary Sirbu, who is representing Bey IV’s co-defendant, Antoine Mackey. But Robinson seemed to be caught up in several discrepancies under cross examination from prosecutor Melissa Krum. Among the discrepancies was a claim that she didn’t know Siaw had dated her brother for 18 months. Siaw, called as rebuttal witness, testified that she had no involvement in Roberson’s death and that she knew Robinson when she dated her brother. Siaw also once dated Bey IV, but previously testified that she left the bakery in 2007. Wednesday was the last day of testimony in the case until May 17 because of what Judge Thomas Reardon described as scheduling problems and to give police an opportunity to arrest a witness who didn’t show up to testify and for whom a warrant was issued. The judge said he expects closing arguments to begin the day court resumes and take most of that week. The jury could begin deliberating as early as May 23. 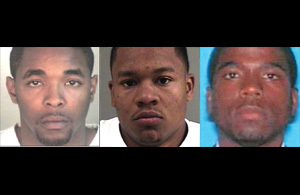 Bey IV and Mackey, both 25, are charged with killing Roberson, Oakland Post editor Chauncey Bailey, and a third man, Michael Wills, in unrelated shootings in summer 2007. Bakery follower Devaughndre Broussard has testified that he killed Bailey and Roberson on Bey IV’s order and that Mackey helped in both slayings. Broussard also said the defendants bragged about killing Wills. Bey IV and Mackey have pleaded not guilty. They face life in prison without parole if convicted by the jury of seven women and five men. Broussard will receive a 25-year prison sentence in exchange for his testimony. Bey IV’s court-appointed lawyer, Gene Peretti, said outside court that Krum has not proven any of the charges against his client. He rested his defense after calling one witness. Sirbu is expected to call three more witnesses when the trial resumes. In Wednesday’s testimony, Robinson said that Siaw told her in fall 2008 that she lured Roberson to a dark street corner where Halfin killed him. Roberson was the uncle of a man who was convicted of killing Bey IV’s older brother in 2005. Broussard testified in March that he killed Roberson on Bey IV’s order as “eye for an eye” revenge, and that Mackey carried an SKS assault rifle to the shooting scene at Herzog and 60th streets. “She said she saw him shot,” Robinson said. Under questioning from Peretti, Robinson said she met Siaw while both were applying for jobs at Sears in Oakland and they became friends. Robinson said Siaw told her the story about Roberson’s killing after becoming angry that a co-worker “disrespected her” by refusing to call her by a Muslim name. Under cross examination, Krum questioned whether Robinson fabricated the story to get back at Siaw over a dispute about money and anger over the woman’s relationship with her brother. Robinson denied both charges. When Robinson testified that she had never been to Siaw’s house, Krum presented photographs she said were taken of Robinson at the residence. The pictures showed distinctive hummingbird tattoos on Robinson’s shoulders that were visible to jurors when the woman entered court in a halter top. Robinson said the photos were of her, but said she was unsure where they were taken. Siaw later testified the photos were taken at her house. Robinson also said she didn’t know Siaw had dated her brother for nearly a year and half. Siaw, though, testified that the women met through the brother, and had known each other long before Robinson claimed in her testimony. “I didn’t know it until I confronted (my brother) yesterday,” Robinson said of the relationship. Yet she told Sirbu she was certain that her brother had dated “14 women” over a several year period. “Keeping score, huh?” Reardon said from the bench. In earlier testimony Wednesday, a former bakery member asserted his Fifth Amendment right against self-incrimination and refused to testify. Richard Lewis was convicted last year of kidnapping, torture and other crimes and is serving a life sentence without parole eligibility at Pelican Bay State Prison in Del Norte County. Reardon, who described any potential testimony by Lewis as fraught with legal complications, granted Lewis’ claim during a brief hearing. Defense lawyers wanted his testimony in the case. Sirbu claims that Lewis, not Mackey, was the getaway driver after Bailey was shot on Aug. 2, 2007. Sirbu also claims that Lewis shot and killed Wills in July 2007, largely because a witness described a man fitting Lewis’ physical description running from the scene. Lewis is 5-feet, 8-inches tall; Mackey is listed as 6-feet, 2-inches tall in jail records. Lewis, in a red jail jumpsuit and shackled at the waist, sat in the jury box with his attorney, Pat Hetrick, answering Reardon’s questions in a barely audible voice. Hetrick said previously that Lewis wanted to “pick and chose” what questions he would answer. On Wednesday, Hetrick said his client had changed his mind and accepted his advice not to testify. Since Lewis has appealed his conviction in the kidnapping and torture case, Reardon said that there was little that he could testify about that would not be incriminating. Even answering a simple question like “how long have you known Mr. Bey,” could have been problem for Lewis, “given the evidence I have heard,” Reardon said. Broussard described Lewis as a longtime family friend. Sirbu has claimed Broussard was protecting Lewis by incriminating Mackey in the slayings. Reach investigative reporter Thomas Peele at tpeele@bayareanewsgroup.com. Follow him at twitter.com/thomas_peele. Looks like Peretti is going to mount a serious defense!